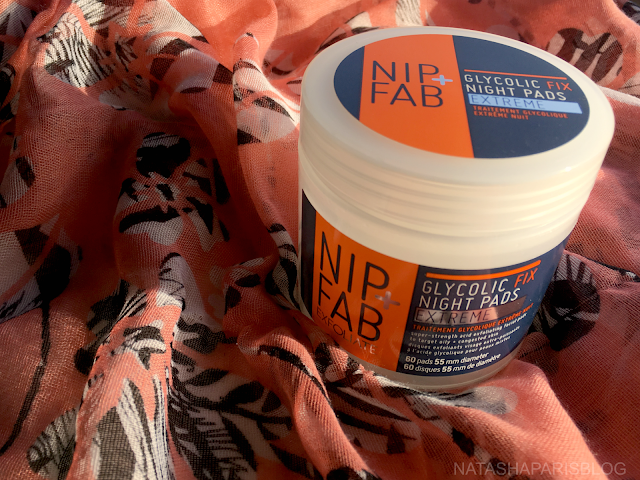 I've been using the Nip+Fab Glycolic Fix Extreme pads for a little while now and I've been impressed with them. I would say that I have combination skin, although at the moment my skin is that little bit drier than usual. I've been using these pads a few times a week, after cleansing, to help exfoliate my skin and make it look that little bit brighter. Although I don't tend to get a huge amount of spots, when I do them they like to come out in force (ain't nobody got time for that!). I've found that since introducing this product into my skincare routine my breakouts have been less frequent, which is always a positive. I have been asked if I'd found the pads to be harsh on my skin. Personally I've not found them to be too harsh,however the product the pads are soaked with is very concentrated so this may be something to bear in mind. If you do have sensitive skin I wouldn't recommend using them quite as often, or it might be worth trying out one of the 'regular' products (such as Nip+Fab Glycolic Fix Exfoliating Facial Pads) rather than the extreme version. This is the first product I've tried from Nip + Fab but I'd definitely like to try out more in the future. Let me know if you have any recommendations.